About "Lines and angles worksheet"
Worksheet given in this section is much useful to the students who would like to practice problems on parallel lines, perpendicular lines and angles formed by transversals. Think of each segment in the diagram as part of a line. Which of the lines appear to fit the descriptions given below ? (iv) Name the plane(s) that contain D and appear to be parallel to plane ABE. Construct a line that passes through a given point P and is perpendicular to a given line l.
(iv) Name the plane(s) that contain S and appear to be parallel to plane QRVU. 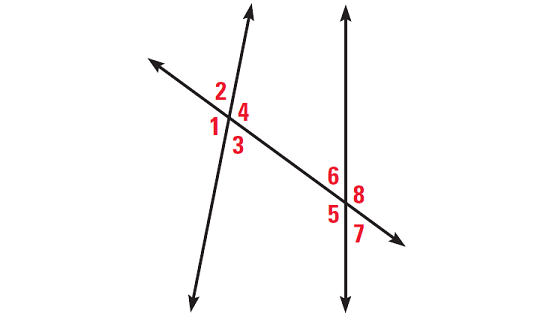 In the diagram given below, list all pairs of angles that fit the description. CD, GH and EF are all parallel to AB. But, only CD passes through D and is parallel to AB. BC, AD, AE and BF are all perpendicular to AB. But, only AD passes through D and is perpendicular to AB. DG, DH and DE all pass through D and are skew to AB. 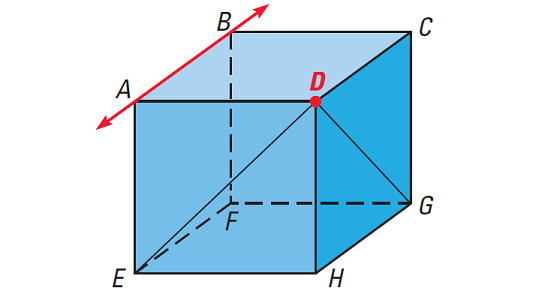 Only plane DCH contains D and is parallel to plane ABE. 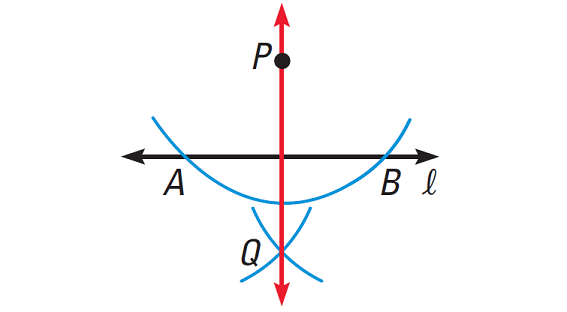 Place the compass point at P and draw an arc that intersects line l twice. Label the intersections as A and B. The diagram given below illustrates step 1. Draw an arc with center A. Using the same radius, draw an arc with center B. Label the intersection of the arcs as Q. The diagram given below illustrates step 2. UV, WX, and ST are all parallel to QR. But, only ST passes through S and is parallel to AB. QT, RS, RV and QU are all perpendicular to QR. But, only RS passes through S and is perpendicular to QR. ST and SW pass through S and are skew to QR. Only plane TSWX contains S and is parallel to plane QRVU. After having gone through the stuff given above, we hope that the students would have understood "Lines and angles worksheet". Apart from the stuff given on "Lines and angles worksheet", if you need any other stuff in math, please use our google custom search here.